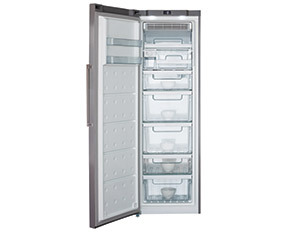 The FF881SC is a full height freestanding freezer. It comes with an impressive A+ energy rating for total efficiency and a 4 star freezer rating for safe fresh food freezing. Its 7 compartments offer capacious food storage options and, coupled with the FF821SC full larder fridge, it will offer maximum food storage capability for your home. Our freestanding freezer range can be located to suit you and will safely bring fresh items down a long term storage temperature quickly, using our fast freeze function. Stock up and store your favourite freezable meals to give you peace of mind that there will always be something tasty for dinner, no matter how hectic life gets.